Which is your most favourite song in the history of Hindi film music during the past eighty years? If any body puts this question to me, I would rather not answer, as how can you choose just one song out of thousands of songs especially if you consider that versatile singers like Rafi Saab, Lataji, KK, Ashaji, Mannada, Mukeshji, Hemantda, Talatji, etc. etc. have sung so many wonderful wonderful songs. But precisely a similar exercise was carried by the Magazine OUTLOOK in their 2006 June issue. Thirty prominent musicians of the Hindi Film Industry including Manandey, Mahendra Kapoor, Khayyam, Rajesh Roshan, Gulzar, Javid Akhtar, etc. were chosen to be in the Jury and were given the task to select the best songs. The Jury came out with 20 songs sung by various Singers like Rafi, Lata, KK, Mannadey, Asha, etc. set to music by stalwarts like SDB, RDB, Roshan, Madan Mohan, Khayyam, Salil Chaudhury, Hemant Kumar, etc. Some of the songs in the list would be wholeheartedly agreed by majority of the music lovers but some reservation would be expressed regarding certain other songs from the list. First let us go through the list. The no. 1 song considered was Man Re Tu Kahe Na Dheera Dhare (Chitralekha). This song was followed by other songs like Tere Mere Sapne and Din Dhal Jaye from GUIDE, Kuch To Log Kahenge (Amar Prem), Waqt Ne Kiya (Kagaz Ke Phool), Jo Wada Kiya (Taj Mahal) and Pyar Kiya To Darna Kya (Mughal E Azam). The journey continues with Ai Qateeb E Taqdeer (My Sister), Aayega Aayega (Mahal), Piya Tose (Guide), Main Ye Sochakar (Haqeeqat), O Sajana (Parakh), Kuch Dilne Kaha (Anupama), Zindagi Ke Safar Me (Aap Ki Kasam) and Tum Jo Mil Gaye Ho (Hanste Zakhm). Other songs in the list are Dil Cheez Kya Hai (Umrao Jaan), Chura Liya Hai (Yaadon Ki Baraat), Tum Pukar Lo (Khamoshi), Har Ghadi Badal Rahi (Kal Ho Na Ho) and Poocho Na Kaise (Meri Soorat Teri Aankhen). The list contains five of SDB, three of RDB, two each of Roshan and Madan Mohan, and one each of Hemant, Khayyam, Naushad, Salil Chaudhury and Shankar Ehsan Loy. But there are no songs of SJ, LP, KA, OPN. Similarly Rafi and Lata lead in the Singers Category whereas Talat and Mukesh do not find a place, unfair one must say. Few would have any reservation about the No.1 song – Man Re. A classic song with just two antaras sung by Rafi Saab, written by Sahir Ludhyanvi, music by Roshan and picturised on Pradeep Kumar. The song is more philosophical conveying the moral dilemma of a person caught between a Courtesan and a Bikshu. Whether you consider the music which is so melodious, the lyrics which is so meaningful or the singing, who else could have justified the song other than Rafi Saab, this song has good credentials to become the Number 1 song. But, still, I am sure some music fans would have opted for Baiju Bawra’s “Duniya Ke Rakhewale” which catapulted Rafi to the top slot as well as which was a much more difficult song sung at a very high pitch or Pyaasa’s “Yeh Mehlo Ye Takhto”, which was a sort of revolutionary song depicting the utter contempt of the Poet towards the Society. Among other songs, the two Guide Rafi solos make the mark due to sheer class so also the Haqeeqat number, which is a unique song without the conventional mukhda and antara as well as the Hanste Zakhm song, which is good to see that at least after thirty years this unique song is getting its due. Though the Taj Mahal duet is good, still one would wonder at the exclusion of duets from Maya, Ishq Par Zor Nahin, etc. In the same way, though Chura Liya Hai is good, perhaps Ye Dekhake Dil Zhooma and Abhi Na Jao Chodakar were better. How to fit in other Rafi greats like Suhani Raat, Hari Om and the innumerable number of gazals / geets like Kaise Kategi Zindagi and Jis Raat Ki Khab Aayi. What about the mother of all qawalis Na To Caravan Ki Talash Hai. The three Lata numbers from Anupama, Parakh and Mahal are good selections, but the other two Lata songs from Guide and Mughal E Azam are surprise selections, as one can find umpteen number of other wonderful Lata numbers from movies like Mera Saya, Hanste Zakhm, Dil Apna Aur Preet Paraye, Maya, Dil Ek Mandir, etc. Perhaps the Guide and Mughal E Azam songs were selected due to their total appeal, picturisation significantly contributing to their selection with beautiful and innovative dances by Waheeda and Madhubala and restrained acting by Dilip Kumar. Geeta Dutt’s Waqt Ne Kiya selects itself especially with that unique picturisation with the light shaft and memorable performance by Guru Dutt and Waheeda Rehaman. Kishore’s selection of the two songs are bit disappointing because Kishore has sung some very good songs in the early sixties especially for himself in movies like Door Gagan Ki Chaon Me. Similarly Saigal could have been represented by Soja or Ek Bangala or Jab Dil Hi. Hemant has been named for Tum Pukarlo, but Hemant was equally good in Na Ye Chand Hoga and Ye Raat Ye Chandni. Similarly Mannadey has been selected for Poocho Na Kaise Maine, but what about Laga Chunri Me Daag or Bhay Bhanjana? Similarly I would have preferred Asha’s Chain Se Hum Ko Kabhi or Poocho Na Hame Hum Unke Liye. Perhaps the biggest surprise is the song from Kal Ho Na Ho. Even the makers of this song would be embarrassed to be in the company of such illustrious songs. Perhaps the Jury wanted at least one song for this generation. If I were in their position, perhaps I would have selected Chitti Aayee Hai Watan Se, for the beautiful picturisation made memorable by Akash Khurana with his superlative acting. Similarly the selections considered GUIDE as the most popular movie, SD Burman as the most popular Music Director, Shailendra as the most popular Lyricist and Rafi and Lata as the most popular Singers. I am sure, every one would come out with his own list, but a fair selection will be to cumulatively list out all the songs from all music lovers for getting a fairly good representation rather than restricting to just twenty. This entry was posted on Sunday, March 21st, 2010 at 3:46 am	and is filed under Meri Awaaz Suno. You can follow any responses to this entry through the RSS 2.0 feed. You can leave a response, or trackback from your own site. All you guys have great sence of music. Am glad to read and know how close all of you are to Mr. Mohammad Rafi. I enjoyed reading every word. It is a big surprise to me that no song from Kashmir ki kali is included in the list of 20 songs, I am really surprised how the judgement has been arrived at. Yeh chaand sa roshan chehra – the modulation, melody and flexibility in the rendition – probably such beautiful song is rare to be composed or sung in the manner sung by rafi ji – The song surely deserves to be in the top list. Jo wada kiya woh – surely deserves and it has been rightly included. Manna de song though a duet with Pandit bhimsen joshi – ketaki gulab juhi from basant bahar, too in my view, should find a place – one of the nice songs in the classical range. Last line 1980’s – no one cares who is the singer or music director -great humour – Correct, today, from 1980’s onwards no body cares who is the singer or music director. Filmy music has lost its golden sheen of yesteryears. Thanks Bhagchandani-ji for your response. I agree, the orchestration in “Aise to na dekho” contains shades of RDB, especially the guitar-tabla combo. RDB and Meera Dev Burman were the brainchild behind some of SDB’s compositions (ofcourse these compositions also contained the SDB touch). RD’s association with Rafi goes back before “Chhote Nawab” (1961). I don’t know much about music but I think RD best film as music was teesri manzil where all songs went to mohd Rafi….RD last film with Mohd rafi was Shaan and he used mohd rafi more than any other singer…. There are many in world they never saw Pele playing football but they say Pele is better than Maradona as footballer!!!!!?? SD was one of the top music director ever born in bollywood but I feel Rd is not even 10% of his father. In my last post I missed an important point. Before writing my comments on the photograph, first thing I should have done was to convey compliments to Ali Rashid saab for uplinking the wonderful photograph supposedly taken during Teen Deviyan song rehearsal. The snap is great, a real collector’s item. Rashid saab please keep it up, looking forward to more such stuff. R.D. Burman had been assistant to his father during those days. So your guess about the photograph appears to be most probable. You have rightly guessed the song to be ‘Aise to na dekho…’. The orchestration at the beginning of the song has so much of RDB touch. It may not be exactly a case of ghost-composing. The initial ‘conceptualization’ of the tune must have been done by senior Burman. RDB must have ‘worked further’ or detailed out the concept, hence in the process a bit of RDB touch can be felt. Here is a riddle for all of you. a) what is the song in question ? b) is pancham ghost-composing a rafi classic ? c) is it a rehearsal session which pancham is co-ordinating on behalf of sdb ? My guess is “Aise to na dekho”, based on raga gara. i heard some story about this that i wish someone could verify. shammi kapoor was a staunch loyalist and the producer for manoranjan. his original hero was supposed to be rajesh khanna who of course insisted that the singer who had a role in bringing him to stardom sing all the songs – kishore kumar. film production probably happened in 1973 when rajesh khanna was at his peak. i hear that at the last minute he dropped out and so sanjeev kumar filled in. don’t know if this is true or false but its a theory i heard. i don’t know how early songs are recorded before the shooting of the film. its seems a bit of the stretch to finish the entire album even before a significant amount of the film with its lead actor is completed. My take on the RDB/ Kishore/ Rafi saga is that, yes, RDB did prefer Kishore over Rafi for about 6 years (1970-76) and in the process missed out on creating some ‘classics’, given the kind of popularity, amount/ type of work he was getting in those heydays of his. Musically ‘Amar Prem’ could have been Junior Burman’s ‘Guide’ had he given a couple of songs to Rafi saab and some to Kishore. Similarly ‘Ye jo mohabbat hai….’ (Kati Patang), male version of song ‘Mere naina sawan bhadon…’ (Mehbooba) would have been great in Rafi’s voice. Kishore had a special voice which was best explored by Senior Burman in 1950s and 60s. pancham did give step-motherly treatment to rafi-saab at some points in their association. the aandhi example you mentioned is one. in manoranjan which was produced by shammi kapoor, we find no rafi-saab for even a single song which is surprising. in films such as daulat ke dushman, goonj, ujala hi ujala etc. pancham gave better songs to others. however having said that, rafi still has a strong presence in pancham’s output, which is the point i have been making all along. when we talk about the best of rdb, rafi’s name will pop up whether one likes it or not. rafi-saab was a singer who always made his presence felt no matter what the situation or circumstances, because he was a god-gifted talent. I agree, rafi would have done wonders to other pancham creations, but those who sang them, sang them well in the end. On the other hand, we know sdb was not well in the 70’s, but he did handle a good number of his own films during that period (i.e sharmilee, abhimaan, gambler, us paar, yeh gulistan hamara etc.). rd only came in when sd needed to complete some of his scores or additional help. otherwise sd had a capable team of basu-manohari (rd’s assistants too), anil-arun, and meera dev burman. although rafi still sang awesome sd creations such as “mera man tera pyaasa”, “mehbooba teri tasveer”, “teri bindiya re” etc. which rank among the best of 70’s sd, the old monk had turned kishore-wards. sd had a knack of going by his whims, so although we missed out on more sd-rafi magic in the 70’s (apart from their songs), it did not matter, as sd and rafi already created history before. kishore got to sing nice songs for sd during the 70’s, which he did great justice to. Also, when looking at sd’s and rd’s use of rafi in the 70’s, it was beta who used rafi more than baap during the 70-75 period, which is quite interesting. Favouring kishore kumar was not a deal but ignoring Rafi sahab was! I`, m also not talking of politics but if its there why should we deny! Ali rashid ji, can I ever be disagree with u as I respect all ur word… I only wrote in objection of this word that Rd gave something to Rafi sahab, its only the inverse case. Just listen, rafi sahab singing, “kabhi mere gam ki kahani dil se na kehna,kabhi meri baat chale to sun ke chup rehna, mera kya hai kat jayegi zindagi……tum bin”……… can anyone other than God give anything to someone with such a voice and divotion like Rafi sahab….If Rd would had to give anything, he could make this sad version little longer! Now remember, aandhi,…what rd gave to rafi sahab, was,”salam kijiye” with two othwr strugler or new comers, amit kumar and bhupindra.Is this u give to singer with such a stature that of Rafi sahab. But it was humble nature of Rafi sahab that not only agreed to sing but sang so beautifuly. etc… Rafi sahab is only given duets or in most of them,none! I never mean to say that the song that kishore da sang would have been given to Rafi sahab but what I mean to say that, that time music director had freedom to add a song in a movie for whatever tune a music director use to make they request lyricist to write according to that add or remove few words from a song. It was a team work, so they could easily make song for Rafi sahab. today its only AR rehman,in hindi film, who make music with being in direct touch of song writer for many days and do so many rehaershal. Sd burman ji when made “khwab ho tum” for kishore da he made “aise to na dekho” and “kahin bekhyal hokad” in same movie for Rafi sahab. Objection is not for khwab ho tum, but if even aise to na dekho would have not given to Rafi sahab it would have surly felt bad! But as muthyji say, whose loss is it,anyway? Could he ever be able to make any movie like that of pyaasa or guide….that is tagged with Sd burman. Only compliment ,we have is that whatever songs Rafi sahab couldn`t get,all those songs Kishore da sang exceptionaly well with best of his ability but it surly creates a void for no one can imagine what could Rafi sahab create from a song like, main shayar badnam”….as this song has reality of life, drink and sarcasm that is typical of Rafi sahab`s genious of singing! Agreed, RDB was talented. Agreed he ignored Rafi in the early to mid 70s. Agreed Rafiji could not sing many of those slow and sad numbers during that period. But who was the loser? Definitely not Rafi Saab, who had showed his class in so many songs over a period of 30 years. It was only Pancham who lost out. I still fail to understand why a talented MD like him, ignored Rafi and went to KK for songs not suited to him. Agreed RDB gave some very good songs to KK, but for certain songs KK was not suited and definitely Rafi would have lifted the quality of the songs and RDB need not have given 23 flop films in a row. I agree that pancham did favour kishore over others many a times, but I was not referring to the politics that took place. Regardless of if pancham played politics or not, his rafi output is wonderful. 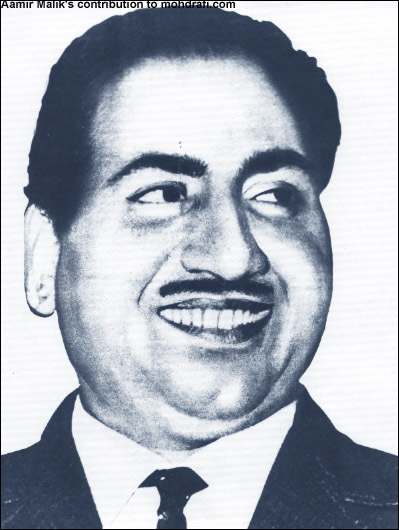 He gave rafi diverse compositions ranging from a “aye jaan-e-wafa” to a “rut hai milan ki” and so forth. As you also pointed out along similar lines, pancham needed rafi, and it was the greatest singer who gave success to pancham at various points throughout his career. We did miss rafi-saab in those sad/slow songs of the early 70’s in amar prem, aandhi, parichay etc. where he would have done wonders to the songs, however, a) rafi did not need these songs in his repertoire, as he already has many songs of this nature which are glorious, along with the fact that he was still singing such songs composed by others (maybe not rd) during the period in question, b) kishore did a great job singing those songs, c) rafi has his share of such songs in pancham’s output which are no less excellent (such as “zamane ne maare”, “pyar hai ik nishan qadmon ka” etc.). A friend of mine rightly pointed out on this forum a while back, that pancham’s lifetime best compositions are those such as “wadiyan mera daman”, “tumne mujhe dekha”, “tumhein dekha hai maine”, “ni sultana re” etc. where no other singer would have done justice to. Also remember that pancham himself referred to the rafi ghazal from chandan ka palna as his “prize composition”. Indeed, the team of nasir hussain, pancham, rafi-saab, and majrooh sultanpuri are one of the best associations to have graced cinema. It is a fact that pancham reserved his very best for nasir hussain, and along with rafi gave us amazing gems. From 1966 (teesri manzil) until 1981 (zamane ko dikhana hai), they set trends, and re-defined popular music, along with providing classy gems as well. I actually prefer the rafi sad version of “tum bin jaun kahan” to all other versions. It is an awesome piano-based composition, and shows the highs the rafi-rd team could reach. ALI RASHID JI, I`m among those many who can never agree with u to say RD was impartial! I know him very close both professionally and personaly! As u mentioned, u surly know what kind of singing “illahi tu sun le ” is..Rafi sahab sang in the voice of a pre -mature adult and not in a fun but a song to reach heaven. Rafi sahab was not such a person whom worldily person like Pancham etc would give anything, Allah has already blessed Rafi sahab,and he was dedcated to God only.As far as RD is concerened, on reverse Rafi sahab gave him recognisation to be established as a elite music director when Rd was just struggling…Abhilasha, teesri manjil is an example only. As people started knowing RD , Rd became popular by controvery and even that he used rafi sahb`s name by giving the songs of Ardhana to kishore kumar that his father made for Rafi sahab…U already know what a role controvery play in film industry,a flop film becomes a hit and a filthy actress become sensation of nation. Let me not include Rd in this list for Rd was really extra talented and genious too. But he coveted Rafi sahab`s share. Film, amar prem, although Ashaji was his main femal voice but he chose Lataji for “raina barse” but on male part he always ignored Rafi sahab completly on such songs…we really miss slow sad songs of Rafi sahab in 70s..
Also, in movie of song tum bin…his composition for kishore kumar was a sad number but for Rafi sahab it was only romantic and the sad version of Rafi sahab has just a few lines,or rather one line,with too much noise of piano. It was Rafi sahab who again and again proved his master nature. The 1972 song, chura liya…is such a song u give to a singerlike Rafi sahab, just a line that too in last, but even in just few lines in last, rafi sahab made his presence so strong that it became rafi sahab`s song. In second half of 70s, Rd burman had very bad times all major producer director turned their face away from him, eventhe one with whom he made aradhana, Rd was in shoch and very low in his own heart! Rafi sahab was once again emerging as a superpower of singing, with his songs like teri galiyon me, laila majnu…and sensational amar akbar anthony where, he surpassed even Amitabh -kishore rap, my name is anthony gonjavlis..with his three songs, tayabali, shirdi wale, parda hai parda etc.. It was nassir hussain faith on Rafi sahab that he wanted Rafi sahab to sing in his film, hum kisi se kam nahi..and Rd made no objection as everyone where surprised by Rafi sahab new singing dimension.And when music released, songs like chand mera dil, kya hua tera wada became such a hit that RD once again became a star, here again by Rafi sahab`s help…now RD was eager to sing with rafi sahab, Rafi sahab told RD that he won`t sing Yamma yamma but RD requesting agian n again made Rafi sahab Ready…the same Rd who openly went against rafi sahab…but now it was too late Rafi sahab only stayed 0ne n half year from then…..and song like maine puchha chand se came in same small period!!! When pancham career fell again in late 80s, he could never come back and had heart attck listening that subhash ghai has given , Ram lakhan to LP ,although he promised to RD.